Flame spread is a surface measurement that determines the speed and distance that a fire can travel along the surface of a material, such as a coating, wood product, or a composite. In the U.S., the standard surface test is the ASTM E84 Flame Spread (also known as UL723, UBC 4-1, and NFPA 255). The test is conducted in a 25 ft. long oven known as a Steiner Tunnel. Flame spread tests for various applications may differ in sample orientation and in the severity of the heat exposure. The specific tests are prescribed by codes of the authority governing the applications. These tests may also include other factors measure during the exposure, such as smoke developed, heat release rates and toxic products of combustion. Heat transfer tests determine a system's protection against a fire, by measuring the temperature rise on the rear surface when the front surface is exposed to a fire. For example, a surface may require 60-minute fire protection according to a specific code or standard. This means that during a fire, the temperature of the rear surface will not rise more than a limited amount for 1 hour. This is an important application for NoFire products. Flashover is the condition, demonstrated in the Rockland Training Center Video, when a small localized fire suddenly engulfs an entire room or area. Typically, the onset of flashover is accelerated by the ignition of wall surface treatments, such as paint and wallpaper. 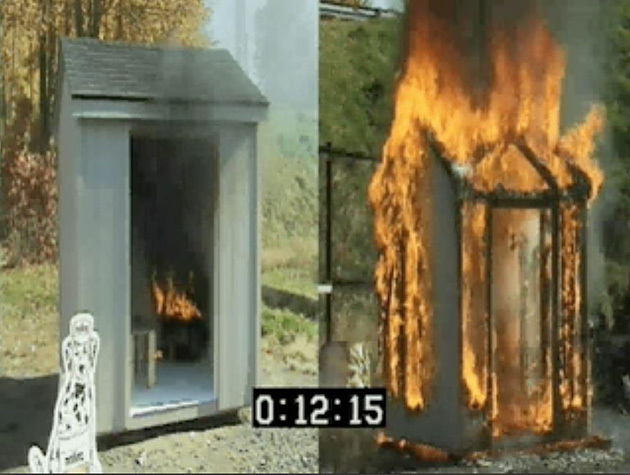 Room flashover tests, such as Uniform Building Code (UBC) 8-2, measure the total amount and rate of heat release by a wall and ceiling surface treatment when exposed to a standard heat source. These are reliable determining factors for room flashover. As evident in the Rockland County video, the extreme heat and smoke generated during flashover will rapidly spread to adjacent rooms in a house. The prevention of flashover is a primary goal of NoFire on land as well as at sea. In addition to these three categories, there are more specialized tests required for certain applications, such as incombustibility, rate of heat release and ignition temperature. Answers to questions about any tests can be found in the technical manual, or contact NoFire Technologies' technical department. NoFire paint applied to the walls and ceiling of a room can effectively eliminate them as contributors to FLASHOVER! uncoated, is totally engulfed in flames. survival for anyone in the vicinity is nearly zero.